City avoided a possible FA Trophy shock thanks to a great second half strike from Sean Rigg at Bostick League South East Division side Horsham FC this afternoon. Although City had controlled the tie for long periods it was still finally balanced at 1-1 before Rigg’s 65th minute intervention, after which they saw out the game with few scares. An early shot from Hoare was well dealt with by 16-year old keeper Harvey Wiles-Richards – drafted into the team in place of unwell no.1 Ryan Clarke – but it was City who struck first on 10 minutes. A well-worked corner routine by Rigg and Adam Mann saw the latter’s driven cross thumped home by Jack Batten for this first goal of the season. City were now seeing the majority of possession but the Hornets posed a threat on the break and one such move saw Wiles-Richards produce an excellent stop from Richardson-Brown’s low shot. However, he could do nothing about the hosts equaliser on 28 minutes, Harris’ perfectly struck free-kick from 18-yards out finding the net via the post. City continued on the front foot despite this setback, their best chance before the break seeing an unmarked Ryan Brunt head Rigg’s cross narrowly wide. And this pattern didn’t change into the second half. Despite this they had largely been restricted to efforts from range by Horsham’s well marshalled defence but when Rigg cut in from the left flank on 65 minutes he produced a perfectly placed shot that gave vocal keeper Pelling no chance. It was City who continued to create chances after this, keeping Wiles-Richards well protected at the other end, Tom Smith, twice, and Ross Stearn testing Pelling and Robbie Cundy directing a header just wide. 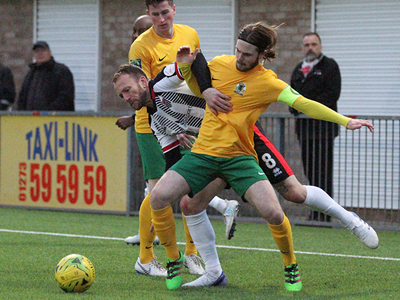 Smith saw another opening well saved by Pelling which allowed for one last nervous moment in the final minute of stoppage time when Horsham won a free-kick deep in City’s territory. However, the cross was well dealt with by City and seconds later the final whistle ensured it would be the Romans name in tomorrow’s 1st Round proper draw. Watch Bath City on Match of the Day Kickabout now!